Galletta's Go-Karts - Kenny Lindsley Jr.
Sundays from June-August & Saturdays from September-October, and summer Fridays at Oswego Speedway. We race exclusively with limited-modified 5hp Briggs and Stratton flat-head motors all with affordable 100% stock parts at Galletta's, & 5-8hp motors at Oswego. 2007/08/26 - Photo by Chris Stevens. Who are your favorite drivers/cars/ teams and inspirations in your driving career? I would have to say I root for whoever is making a move. And I have too many inspirations to say. How and where did you become involved in racing? Mike "MC" Howell introduced me to the site and asked me if I wanted to go with him, my father gave me a ride there and has raced with us since. Why do you race at Galletta’s Greenhouse Go-Kart Speedway? It's fun, close competition, the track has it's fun and challenging spots and just feels like a blast to be on the track. What are your most memorable moments in racing? Championships / Big Wins? Would have to be the rookie split win where I waved to Ryan as we crossed the line. 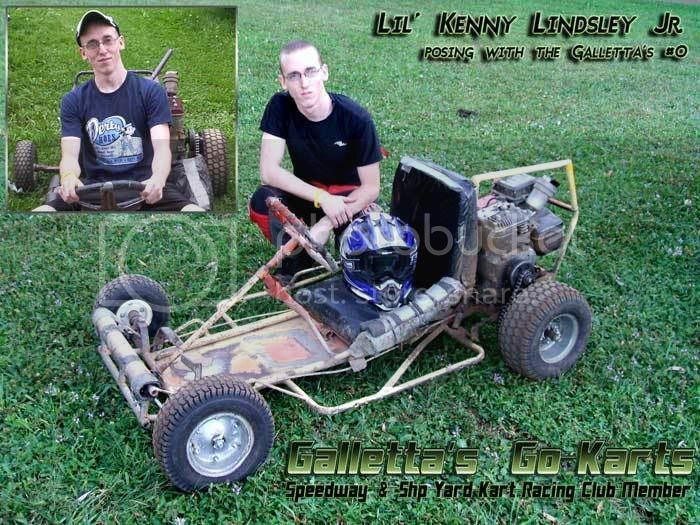 (Since then, Kenny scored a top-five trophy-scoring position in the 2007 Oswego Speedway Classic "Yard Kart Division"). What do you do when you are not racing and/or in the off-season? I play video games semi-professionally, planning on going to school to design them in the future. Kenny is currently in the Marines and missed the 2007 Klassic due to boot camp, and most of the races since. He plans to race full-time when his service is up. . This website is owned, created, maintained, and copyrighted © by Chris "Chrusher Comix" Stevens (including all text, pictures, artwork, video clips, and descriptions). The views expressed are not necessarily the opinions of others at the Galletta's Go-Kart Club or Galletta's Greenhouse (unless otherwise noted). This site is meant to both document the races at Galletta's Go-Kart Club and also get a good laugh with some humor by a cartoonist (AKA, me), so lighten up.